A video tutorial is now available on the Great Forest website to walk you through the online sustainability Metrics platform. Watch how to analyze and compare data, pull charts and graphs, print reports, and more. The Metrics tool is accessible 24-hours a day. Watch the video and then try out a guest account if you don’t already have a login. This entry was posted in Videos and tagged Metrics. Bookmark the permalink. Did You Know… Big Retailers Focus on Waste? 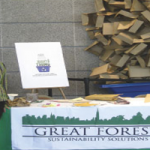 This entry was posted in Did you know?, Recycling, Composting, Waste and tagged Retail Sustainability Report. Bookmark the permalink. This entry was posted in All, News, Recycling, Composting, Waste. Bookmark the permalink.